Orsu Metals Corporation (TSX-V: OSU) (“Orsu” or the “Company”) is pleased to report the commencement of the 2018 exploration program, to test new targets and to culminate in an estimation of a maiden resource at the Sergeevskoe Gold Project in Russia. The Company is also planning to test new targets (Sergeeva, Karamaevskoe - Figure 1) via 3,000-3,500 m of diamond drilling and some 500 m of trenching. These targets were tested in the 1950-60s, when the presence of gold mineralization was identified, but remain underexplored. The Sergeeva Prospect occurs at the immediate western strike extension of Zone 23, with potentially the same style of mineralization. 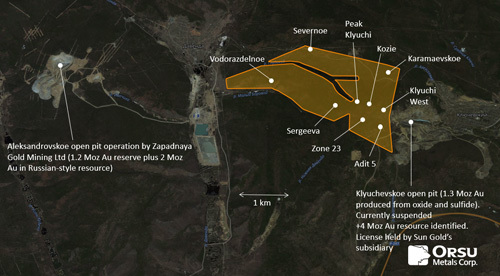 The Karamaevskoe prospect hosts a swarm of quartz veins in the granite, which were historically drilled and trenched for molybdenum mineralization, with gold assayed in collective samples. These works are planned during Q3 2018 upon completion of resource drilling at Zone 23, Adit 5 and Klyuchi West.